or in their catalog this holiday season. I could make my own version of this pillow! Well of course, I never did. Not so, with my talented friend Evi! using her own collection of vintage child stockings. that she had knit and created several Christmas' past. Paula sewed hers to an old grain sack. I hope that you have had a very Happy New Year celebration! Thank you so much for all your well wishes! Carol and George from Maynard Greenhouse. with pom pom Christmas trees...adorable and so clever! Evi's home was Christmas perfection! ohs and ahs and and gasps of delight! It is lovely to have such talented and creative girlfriends! Just look at these angel wings that Evi created for her dress form! sweet Christmas themed altered bottles for each of us! of Evi's lovely home decorated for the holidays. lucky you to be in such fabulous company! the pillows are adorable! happy new year my sweet friend! i love you! Yes I saw that pillow in PB. Your friend is talented a also...Love her pillow and decorated home. Sounds like the perfect way to spend the afternoon, her home is beautiful! 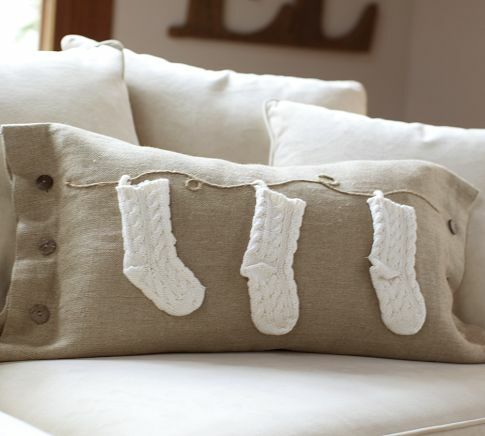 And I just love how creative bloggers are, those pillows are even cuter then the PB inspiration pillow! Holy Moly! That is a beautiful home! I love the pillows too. I wish I had some talented friends (other than long distance) that like to do what I do! You are very lucky and your friends are very cool! I love Evi's blog...her home is just beautiful. She is one amazingly talented lady. So lucky that you got to spend Christmas with her! what wonderful cushions!...and delightful home! Your friend is so talented and her home is gorgeous too. Looking forward to seeing more of it. Oh my goodness I LOVE all of those ideas!! I am jealous all around for the pillows and her beautiful home. You know how much I love Evi's home dear Laura and I also love her take on the Pottery Barn pillow as well as Paula's. Evi's angel wings came out great and that white star is so pretty! Wishing you and your loved ones a very happy & healthy new year 2012! I love to visit Evi`s so beautiful home, and will look forward to more photoes from your cosy visit. Wish you a happy first week in 2012. Evi's home looks lovely! I wonder if she is Greek, we use the name Evi here! Bytheway I received a gift from Carol's shop from my friend Marabeth who lives in Old Saybrook and went to meet her after I had told her I saw her shop on your blog! I just want to pick up that room and transport it to my house. Beautiful! What a gorgeous home she has...and all of the pottery barn pillows are wonderful. Happy New Year to you, my friend! You lot are so clever and talented ..... you can all turn your hands to anything and everything and they all turn out so beautifully. I am sure that you all had a wonderful time together and, to tell you the truth, I'm a little envious !! I want to have been there too !! ( I'm very good at inviting myself to things !!!! haha )I'm sure that you will now be very pleased that I don't live near to you all, as you would never get rid of me !! Many, many thanks for all of your support in 2011 and for being such a lovely blogging friend. From the bottom of my heart I wish you and your family a Happy, Healthy and Peaceful New Year, filled with many magical moments, love and lots of fun. those angel wings are divine! It is just lovely. I'm in awe of their talent. I adore the angel wings. I'm still coming off my high from the visit. I wish it could have gone on forever. There is beauty at every turn in Evi's house. The pillows were so fun to see....those girls are so clever! Hey did you notice the many PB coincidences? delightful...thank you and happy new year to you! Wow, that Evi is talented. I love her space. I'm so glad you were able to visit with her. That's what the Holiday's are all about. Ha, Ha on your comment!! WOW! What talented friends you have:) Evi has a beautiful home. Love all of the pillows. I think Darling you are brave to take on PB with those pillows but let me tell you I don't have the patience for that I rather buy it...but darling that's just me!!!! :) I love the pillows I would buy it from you instead. Those pillows are so cute!! I loved Evi's home tour too...off to pin away!